When you delete a file from your computer it may appear to be gone but in reality the information remains on the hard drive. All that has been removed is the link to the file and until new data is written to the same position on the drive, the file can still be retrieved. This is no problem during the day to day operation of your computer but if you ever sell your computer or gift it to someone you should take precautions to ensure your data is securely removed. To do so you simply have to ensure the hard drive is overwritten with multiple passes of data. The tool that we use in house to do this is called DBAN. 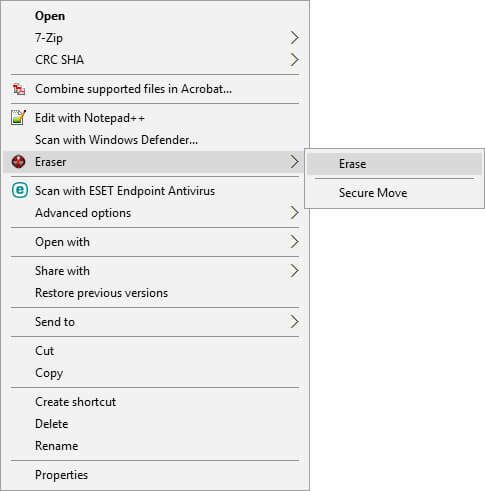 If you want to be more proactive with your data security on a daily basis and securely delete files as and when you are finished with them, you can look to the open source program called Eraser. This free to use program adds an option to your right click menu that allows the secure removal of files by overwriting the data. If you no longer require your hard drive you can employ the services of a hard drive recycling company that will securely destroy the drive. Alternatively, you could take matters into your own hands and break out a hammer! Of course, we don’t endorse or recommend doing so!